"Big" Jack Zelig was a Jewish gangster in New York City and was one of the last leaders of the old street gangs that ruled the Lower East Side. 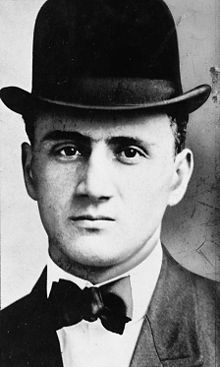 Born Zelig Harry Lefkowitz on May 13, 1888, Zelig was already an experienced pickpocket and thief by age 6, and was a member of Crazy Butch’s pickpocket gang before joining the Eastman Gang in the late 1890s. He became leader of the gang after Max "Kid Twist" Zwerbach’s murder in 1908. With lieutenants Jack Sirocco and Chick Tricker, the gang had over 75 members, including satellite gangs such as the Lenox Avenue Gang, led by Harry "Gyp the Blood" Horowitz. After Zelig, who resided at 286 Broome St., was arrested in 1911 for robbing a brothel, Sirocco and Trick attempted to take control of the gang by refusing to bail out Zelig. Zelig, however, used his political connections to gain his own release and quickly learned from a trusted gang member that Sirocco and Tricker were planning to murder him. Zelig lured the assassin, a gunman named Julie Morrell, to the Stuyvesant Casino (140 Second Avenue, now the Ukrainian National Home) on Dec. 2, 1911. Once there, Zelig managed to get the gunman drunk and another gang member killed him as he stood drinking at the bar. His leadership restored, Zelig retained control of the gang. The various gangs operated in relative peace until the following year when the long-standing Eastman/Five Points feud resurfaced. There were various fights, beatings and shootings between the gangs until the feud culminated on a warm June afternoon in 1912 as Zelig walked down the steps of the Criminal Courts building. A lone gunman walked up to him and shot him through the neck. The Five Points gunman was Charley Torti, a known associate of Louis "Louie the Lump" Pioggi, who himself had gunned down Zelig’s mentor, "Kid Twist" Zwerbach, four years earlier. Zelig amazingly recovered from his wounds - just in time to be dragged into the infamous Becker/Rosenthal case. Charles Becker and his wife, Helen. Charles Becker, a NYPD lieutenant, (who remains the most corrupt policeman in the department’s history), had Zelig in his pocket when, in the summer of 1912, he was named as a prime extortionist in the underworld. A story in the New York World named Becker as one of three corrupt police officers involved in the case of Herman Rosenthal, a small-time bookmaker who had complained to the press that his illegal businesses had been badly damaged by the greed of the city’s corrupt police officers. He told the press he didn’t mind making payoffs as the "price of doing business," but said Becker and others had become so greedy that he hardly had enough left to meet his expenses. When Becker read the story he went wild. He immediately called Zelig and members of the Lenox Avenue Gang, specifically Harry "Gyp the Blood" Horowitz, Jacob "Whitey Lewis" Seidenshner, Louis "Lefty Louie" Rosenberg and Francesco "Dago Frank" Cirofisi, and said he wanted Rosenthal "croaked." on July 16, 1912, just two days after the story appeared, Rosenthal was gunned down in the lobby of the Metropole Hotel in Times Square. In the aftermath, District Attorney Charles S. Whitman made no secret of his belief that the gangsters who killed him had committed the murder at Becker’s behest and went all out to bring him down. The fall-out from the Rosenthal murder was huge, making national headlines, and all of Zelig’s henchmen were rounded up and charged with murder. When it was widely whispered that Zileg would testify against them in exchange for leniency, the underworld took immediate steps to silence him. On Oct. 12, 1912, the day before Zelig was to testify, he was shot behind the ear and killed on the 2nd Avenue trolley just as it passed East 13th Street. Zelig was eating at Segal’s Cafe (76 Second Ave., now a church), when he received an anonymous phone call requesting his presence on 14th street. Zelig jumped on the uptown trolley, and when he stood up at the intersection of 13th Street, Phil "Boston Red" Davidson (of 111 E. 7th St.) approached him and killed him with a police revolver. Zelig was 24 years old. Davidson, still holding the gun, ran East on 14th Street. He had only run a block or so before he encountered a police officer on routine patrol who confronted him and made him drop his weapon. Davidson claimed he had shot Zelig over a $400 grudge, but everyone knew Zelig had been killed to keep him from testifying against Becker. Becker might have thought himself safe at that point, but he hadn’t counted on Jacob Rosenzweig, known in the underworld as Baldy Jack Rose.